For a multiplier μ = 1, then expansionary fiscal policy is a good idea unless ξ ≥ 1.5, unless raising $1.00 in extra tax revenue reduces incomes by more than $1.50. organizations, and missing investment on future productivity.” If so, then a stimulus that gets us out of a recession faster might improve long-term growth and therefore pay for itself. But it all depends on the famous Keynesian multiplier, which tells us whether a dollar of government spending produces more than a dollar of total spending in the national economy. In normal times, they say, government spending has no net effect. The multiplier is usually around zero because the Fed will push monetary policy in a tighter direction if it sees the government goosing the economy too hard. But these aren’t normal times. The Fed has made it clear that monetary policy will stay loose for at least the next couple of years. 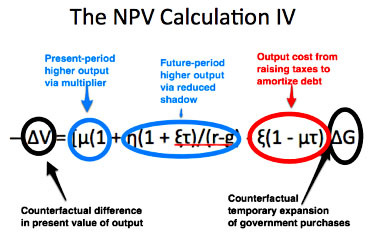 There will be no countervailing action, and the Keynesian multiplier won’t be zero. It will be perhaps 1.0, or more pessimistically, 0.5. If the multiplier is 1.0, “The long-run Treasury borrowing rate needs to be above  9.5%/year in nominal terms for fiscal expansion to be a bad deal.” And even if the multiplier is only 0.5, treasury rates would need to be above 5.75% for deficit spending to be a bad deal. Right now, of course, treasury rates are far lower than either of these numbers, which means that federal deficit spending is self-financing. “There are no costs. No future tax increases are needed to amortize the extra debt, because economic growth does it on its own.” Put another way: “Expansionary fiscal policy passes its benefit-cost test as long as raising $1.00 in extra [future] tax revenue reduces incomes by less than $10.00.” And even the most rabid supply-sider doesn’t think that raising taxes has an effect anywhere near that big. How could this argument go wrong? The fear is that expansionary fiscal policy will lead to a collapse in confidence in the government and a spiking of interest and inflation rates to previously-unseen values: that larger deficits this year will cause Alfred Marshall’s Confidence Fairy to flee and the Bond Market Vigilantes to arrive. Since austerity is more likely to erode the government’s fiscal room to maneuver than temporary expansion, this seems backward. If the logic of this argument is correct, then it is a failure to engage in expansionary fiscal policy right now—a failure to speed recovery and so reduce the long-term shadow cast on future productivity by the downturn—that is the real threat to long-run fiscal stability. I’m left with only one question: how much spending? Surely the multiplier isn’t a constant, but declines as spending increases. So where does it cross the line into being counterproductive? What’s the point at which current-year spending starts to increase the long-term deficit instead of reducing it?